Popularly known for being in red wine, resveratrol deserves the conversation when sipping on a glass. But what is resveratrol, exactly? And what is resveratrol used for? Are there any risks tied to it? This is what you need to know about the powerful antioxidant! Resveratrol is a type of polyphenol and powerful antioxidant. Though mostly known for being in red wine, resveratrol is also found in the skin of red grapes, berries, and peanuts. Resveratrol is also manufactured into supplemental form. While the benefits of resveratrol are primarily explored in laboratory studies, the polyphenol may be useful for heart health, diabetes, cancer, Alzheimer’s disease, respiratory health, and longevity. Resveratrol is generally considered to be safe, still there are special considerations when taking resveratrol supplements. Resveratrol is a type of polyphenol, a micronutrient sourced from plants that functions as an antioxidant. Antioxidants are compounds that fight free radical damage and oxidative stress, in turn showing to benefit the body in a multitude of ways. 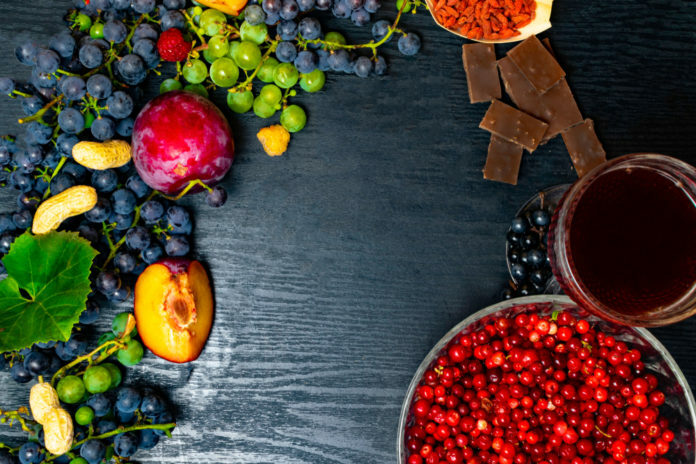 While it is well-known for its suppleness in red wine, other notable foods with resveratrol include red grapes, berries, and peanuts, in which resveratrol is concentrated in the skin. Resveratrol is also manufactured in supplemental form. Long-term consumption of diets rich in plant polyphenols offer protection against development of cancers, cardiovascular diseases, diabetes, osteoporosis, and neurodegenerative diseases according to Oxidative Medicine and Cellular Longevity. Perhaps one of the most acclaimed benefits of resveratrol is its relation to heart health and may have even validated that red wine nightcap… People often take resveratrol for atherosclerosis (hardening of the arteries), particularly in hopes to lower “bad” (LDL) cholesterol levels and increase “good” (HDL) cholesterol levels. Overall observation indicates that resveratrol has high therapeutic potential for the treatment of cardiovascular diseases, suggests research published in Molecular Aspects of Medicine. There is sufficient evidence showing regular consumption of resveratrol can be beneficial for managing diabetes and potentially reduce the incidence and severity of diabetic complications. Likewise, a meta-analysis reveals resveratrol significantly improved the fasting plasma glucose and insulin levels in individuals with type 2 diabetes. Resveratrol may also help reverse insulin resistance, a condition in which cells have a difficult time using glucose as energy, thus remains in the blood, and increases the risk of developing type 2 diabetes. With antioxidants vastly explored in prevention and management in cancer, there is a strong interest in resveratrol’s contribution the quest for a cure. Excitingly, there is evidence indicating resveratrol displays anti-cancer properties and affects all the three stages of carcinogenesis, or the initiation of cancer formation. Researchers believe an Alzheimer’s disease brain is worsened by inflammation, though research at Georgetown University Medical Center shows resveratrol can reduce neuronal inflammation, in turn slowing the cognitive decline of patients with Alzheimer’s disease. Resveratrol my also decrease the presence of beta-amyloid, a protein fragment shown to build up in the brains of people with Alzheimer’s disease. The accumulation of beta-amyloid mostly interferes with the communication of nerve cells and may interfere with cognition. Drinking a glass of wine in search for the fountain of youth might be a solution to turn back the hands of time. Resveratrol may fight aging by mimicking calorie restriction (CR), a technique implicated to promote longevity, and extend the lifespans of yeast, worms, flies and fish. There is also evidence showing resveratrol and calorie restriction has similar anti-aging activities on a gene associated to longevity, leading researchers to imply resveratrol imitates CR. Resveratrol also shows to fight aging by rejuvenating cells and lengthening telomeres. Telomeres are the protective endings of chromosomes that offering defend against cellular damage, which can harm the body and shorten lifespan. They also naturally shorten as the body ages. Research indicates resveratrol plays a protective role in the respiratory system and may be an effective intervention for lung aging. Resveratrol inspire hope for patients with chronic obstructive pulmonary disease (COPD), as it consistently shows to decrease inflammation and oxidative stress in the lungs, which may improve skeletal and respiratory muscle impairment. Are there side effects of resveratrol? To date, resveratrol appears to be safe, even when taking in supplemental form and mega doses. (Well, excluding mega doses of red wine…) However, some people may experience mild to moderate digestive discomfort. 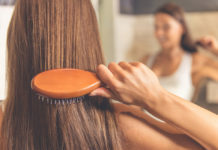 Also as a friendly reminder, the Food and Drug Administration (FDA) has lesser regulatory standards over resveratrol and other supplements, which makes it difficult to know what exactly you are receiving from products and inconsistent quality. What about interactions and contraindications? WebMD reports resveratrol supplements might interact with blood thinners like warfarin and NSAIDs such as aspirin and ibuprofen, which may increase the risk of bleeding. So then, how much resveratrol is recommended? WebMD informs there are no specific dosage recommendations at this time and how much you should take can vary from supplement to supplement. But dosing in most resveratrol supplements often ranges between 250 to 500 milligrams (mg), which is actually much lower than the amounts shown to be beneficial in research. To get the dose used in some studies, people would have to consume 2,000 mg or more daily. Though there is still much to be known regarding practical use of resveratrol, the evidence already poured out is nonetheless compelling. Cohesively, resveratrol bares some powerful antioxidants to benefit the body without considerable concern of severe side effects and contraindications. However, most nutrition experts encourage obtaining nutrients from food and advise to always check with a healthcare professional before taking any sort of supplement. They also warn to moderate alcohol intake: Men should moderate alcohol consumption to two servings daily while women are limited to one. And stressor on the word serving… A serving of wine is 5 ounces, not the entire bottle. Exceeding such recommendations can have some pretty serious consequences on health and deter the potential benefit of resveratrol. 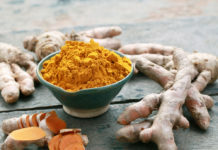 Next articleA Complete Guide: Can Curcumin in Turmeric Help With All Things Related to Health?